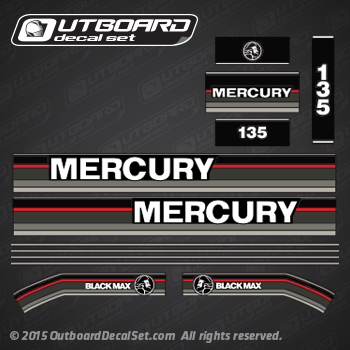 Mercury Outboard decals for 1993 Mercury 135 hp Blackmax L outboard motors. 1991-1993 Mercury 135 hp L: 1135412MD, 1135412ND, 1135412PD, 1135412RD, 7135412AD, 7135412BD, 7135412CD, 7135412DD. 1991-1993 Mercury 135 hp XL: 7135422BD, 7135422CD, 7135422DD, 1135422MD, 1135422ND, 1135422PD, 1135422RD. 1991-1993 Mercury 135 hp CXL: 1135425MD, 1135425ND, 1135425PD, 1135425RD, 7135425BD, 7135425CD, 7135425DD.